Welcome to first edition of Golden Nuggets, where I explore nifty tidbits about the Golden Age of comic books! Did you know many of our beloved heroes have World War II (namely the Nazis) to thank for their early fame? How about the fact that just about everywhere you turned in the 1940’s some superhero was punching a Nazi in the face? Well, its all true people! War was rampant in the comic book pages of the time making superheroes arguably more popular than any period since. For that reason this time frame of comic book popularity was called the Golden Age! If you would like to explore the beginnings of the comic book medium in North-America, then look no further my friends! Today we get a lesson in war propaganda, Golden Age style! Let’s start with the United States before World War II. Popularity for the war in the U.S. was very low, and talk of any support was looked at with disdain despite the knowledge of Nazi atrocities. The U.S. even turned away Jews looking for asylum at the time, and took the attitude that it was a problem “over there.” Enter Jerry Siegel and Joe Shuster’s Superman. Superman was probably the most notable early on due to the fame he had already garnered in early strips. Superman became notoriously famous before the war started because of his dabblings in the events in Europe. Both Siegel and Shuster were Jewish, and strongly opposed to the oppression of the Nazi regime. I would go so far as to assume they were not happy at the U.S. at the time for turning away Jews seeking asylum, but how much impact did a cartoon beating up Nazis really have on the events of the time? The Nazis were aware of Superman and other caricatures made in their, and more specifically Hitler’s image. Due to the familiarity of Siegel’s name with Jewish ancestry he was most notably the center of attacks in retaliation from Nazi supporters. A few names used in hate messages against him included, “the inventive Israelite,” “intellectually and physically circumcised chap,” and other even less flattering remarks. Joseph Goebbels, the Nazi minister for propaganda, supposedly publicly denounced Superman and claimed that he was a Jew. In my research I found out that Goebbels often sent cartoons and foreign media to Hitler himself so he could see how he was being represented. So, it is very likely Hitler saw Superman and many other American comic books that took aim at him! One of the more recognizable symbols of the American efforts against Nazi Germany came from the pages of a new character of the time called Captain America, printed in March 1941. Now I list that date because it was before the attack on Pearl Harbor, which took place December 7, 1941, ultimately bringing the U.S. into the fight. 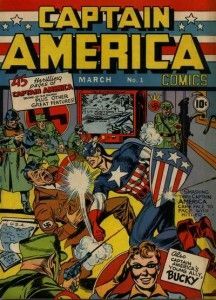 Captain America was not popular when initially released due to the still strong anti-war sentiments in the U.S. Little did his two Jewish creators, Jack Kirby and Joe Simon, realize they would usher in a whole slew of anti-Nazi superheroes! 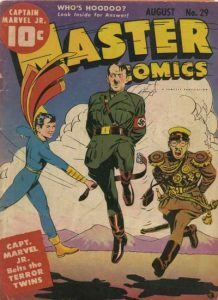 Even though Captain America wasn’t the first to make the Nazis his enemy he has the esteemed position of being the most potent. 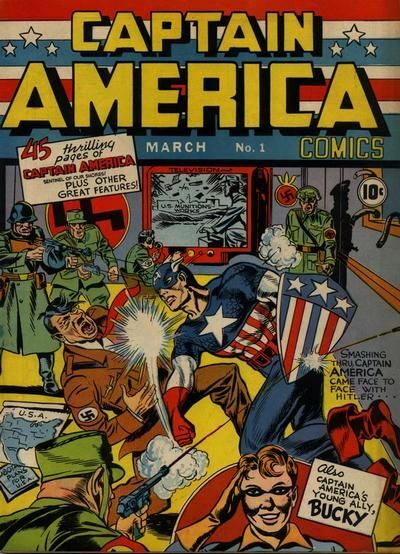 The first issue had Captain America punching Hitler himself! Now how’s that for a symbol? Comic book superheroes may not be the reason the U.S. decided to join the war, but they are often associated with representing the American spirit and encouraging ongoing support. It seemed like everywhere you turned there was a comic book cover with your favorite hero asking you to buy war bonds or fighting the enemy, which included both Nazis and Japanese. Many of these appeared to be simple enough, but some exacerbated and encouraged the ugly anger and hate that many citizens of the U.S. had come to place on all Germans and Japanese. 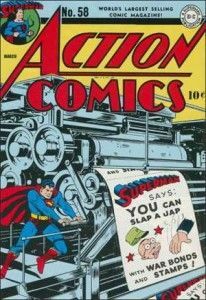 Interestingly this shows up through Superman, the one who basically started it all, who begins to portray his own version of generalized hate to rival the Nazi propaganda machine as seen in the cover of Action Comics provided in this article. After all, innocent Japanese citizens were being put in internment camps, a result of race prejudice, war hysteria, and failure of political leadership. How sad that Siegel was a victim of direct prejudicial attacks himself, and yet portrayed a generalized prejudice through his comics. I personally believe that no time in history has been as direct in its support of war nor has there been a more identifiable enemy than the Nazi. Still, war propaganda continues to exist however slight it may be in the pages of our comic books today. A few notable examples include Marvel Comics yearly salute to the troops in New Avengers: Marvel Salutes the U.S. Military, and DC Comics recent Men of War series. Marvel’s support continues to be the most blatant as Mr. Propaganda himself, Captain America, continues the role that made him famous in the first place by starring on 10 of the 12 issues released to date. As comic books have portrayed current events since their inception I don’t see this trend ending in any foreseeable future. It’s easy to judge the past, when people have come so far since, but then again, have we? Although we don’t have “internment camps” today, do we not still live under a government that spies and generalizes a race/religion based on recent acts of terror? What do you think? How much of an impact do you think recent/current wars have on our comic books? I’d love to hear about it. Great article Chip! I love the actual history behind comics, especially during WWII, when comics, like you mentioned, helped to not only support the war effort, but were used specifically for propaganda against the Nazis and Japanese. Great article, and very imformative too! Cool article Chip. Interesting to read looking forward to more of this. Thanks guys! I learned a lot when I researched this topic. It was a ton of fun!